Our annual Stonewall Scotland Workplace Conference is a must-attend event for everyone involved in the delivery of workplace equality, diversity and inclusion. 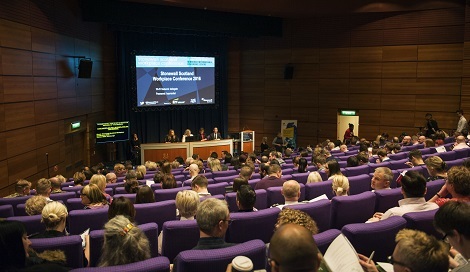 This year's conference took place in Edinburgh on 23 November 2018 and brought together over 200 people from public private and third sector organisations to share the latest innovative thinking, learn about our best practice and develop ideas for creating inclusive workplaces, where everyone is able to be themselves. We hosting interactive breakout sessions, keynote speakers and a panel discussion, and you can now view the slides from these by clicking below. Attendees will hear from Stonewall inclusion specialists and recieve best practice examples to help them build their inclusion work. The conference offered delegates the oppurtunity to leave with practical strategies and access to the latest Stonewall research and resources to help ensure that their organisation remains at the forefront of LGBT inclusion. Each year we welcome over 200 people from the UK’s leading employers, including senior business leaders, HR and diversity professionals, employee network groups, and LGBT staff and allies. Delegates heard from inspiring people who can empower individuals and share their learning on creating change in their workplaces and communities..
One of the most informative and emotional conferences I have attended. I am fairly new within this area, this conference makes me feel proud and privileged to work with Stonewall and ED+I within my organisation. I found the sessions and talking to colleagues very beneficial. I feel empowered that I can go back to work and make a difference. For more information about our Workplace Conference 2018 please email memberships@stonewallscotland.org.uk or call 0131 474 8019.